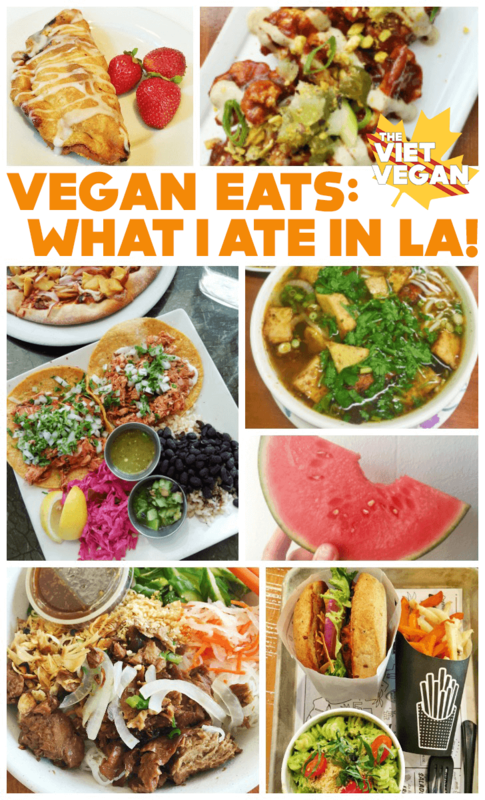 So aside from visiting an old friend, I wanted to eat my way through the vegan restaurants in LA. I learned my lesson after eating my way through Montreal that it’s financially not the most intelligent thing to do to eat out for literally every meal. So for most days, Eddie and I limited ourselves to eating out only once per day, and eating something homemade for the other meals. We started our trip with me freaking out about the giant batch of stir fried rice and uneaten bread that I wasn’t sure what to do with. We managed to scrounge together two pretty hefty sandwiches to eat on the flight from Toronto, but in a panic, I threw the stir fried rice, bread, and whatever other produce that was sure to go off into the freezer. I dubbed that “Future Lisa’s” problem, but I guess it’s my problem now as I write this on the flight home. I’m never optimistic about vegan options in airports, but I was pleasantly surprised at the amount of energy bars and snacks that were labeled vegan at Pearson Airport. Starbucks also has that hummus plate that would work in a pinch, but I think it’s something ridiculous like $9 for a handful of veggies, some pita, and a wee pot of hummus. I was craving pretzels, so I impulsively grabbed a to-go container of Sabra hummus with those weird but awesome flattened pretzels. A steep $5, but that’s the price for impulse buys and convenience. With the time difference in effect, we landed in LA at 10:30 am, just in time for us to bump through traffic and grab dinner at Vinh Loi Tofu. TL;DR: Everything is delicious. Don’t order off the menu, ask them what’s good and they’ll give you something epic. 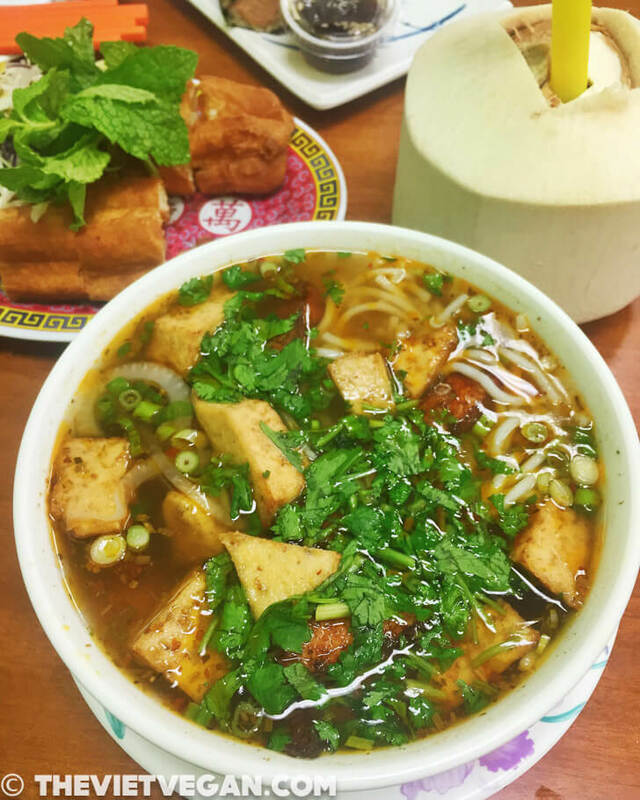 Vegan Vietnamese food is often hard to come by unless you go to a vegan-exclusive restaurant. I’ve been hit with an allergic reaction too many times by Vietnamese restaurants that think fish sauce or chicken broth is vegetarian, so I almost never go to a Viet restaurant anymore. Vinh Loi Tofu has every dish I ever craved from a Viet restaurant and makes it even better. 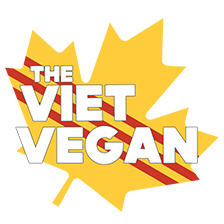 I had a chance to talk to the owner, Kevin Tran, who is Vietnamese and has been vegan for 14 years (as of the date of this post). Like me, his family questioned his vegan diet and would say things like, you can’t eat vegan if you want to be strong, and he decided to prove his family wrong by eating vegan and being as physically fit as possible. Kevin has his marathon medals and fitness trophies all around the restaurant—as if to boast and say “Look how strong I can be while eating vegan”. The restaurant is a pretty small space, there are two sections for seating, but I walked in with 3 people and snagged the last table without issue. Eddie’s and Ashley’s pho came out and looked absolutely delicious and as satisfying as the beef pho I had growing up. I had a sip and that deep, umami flavour with the light notes of star anise and cinnamon came through in the most delicious way. Eddie ranked it a 7/10, but keep in mind, Eddie is one of those people who doesn’t rank anything a 10/10, so it’s pretty much a 7/9. My dish came out and it was the rice noodle bowl with fresh cucumber, pickled veggies, a vegan nuoc mam sauce, and vegan lemongrass duck. It even had the goose-pimpled skin texture, which I found kind of off-putting, but it was so delicious, I didn’t even care. Each piece of the meat was tender, juicy, full of flavour, and had that rich and tender texture I remember duck used to have. I also learned that their tofu is all house-made with non-GMO organic soy beans! I found their tofu very light and flavourful with a great texture, but I’ll be honest, I prefer the tofu from my local Mississauga Tofu house. This was an amazing way to start the trip and had set the bar so high. 10/10 would eat again. (Spoiler alert, we did, and I got the Tofu Robot and it was 10/10 with the epic Chinese donut. I don’t know why I’ve never made my own soup and had the Chinese fried donut in there with it. I’m a fool). TL;DR: Fast food vegan. Didn’t live up to the hype. We went here for dinner and I’ll admit, I was led astray when it came to this chain. First off, I think it’s really cool that there’s a vegan fast-food chain. That’s awesome. The iced tea selection was fantastic, a solid 8/10 for providing both sweetened and unsweetened teas. The selection of stuff was pretty varied too, but I tried the vegan Baja tacos (3/10) and was kind of disappointed. It was bland-ish and not that exciting. I would probably only go to Veggie Grill again if there weren’t any other vegan options around. Not bad, but not great. TL;DR: Not a super nut-allergy friendly place, but everything you can order is delicious. Eddie and I ventured to Harry Potter world on our second day in LA and Sun Café was really conveniently about a 15 minute walk away. We were the first people in the restaurant when it opened and the service was so incredibly friendly and quick! Our server was able to answer which items had nuts and how the kitchen could accommodate my allergies (granted I’m not anaphylactic, I just get hives when I eat nuts), but I imagine they took the same precautions. We ended up getting the BBQ Cauliflower to start, which was pan-seared cauliflower with BBQ sauce, sunflower seed sour cream, and a bunch of other goodness on top. The cauliflower was the perfect amount of cooked: tender and juicy with a bit of bite left so it wasn’t just mushy vegetable. We devoured this relatively quickly, but our mains came immediately afterwards. Eddie opted for a giant Caesar salad, which he deemed it a 7/10. It didn’t blow him out of the water, but he ate it all nonetheless. I got the maiitake philly cheesesteak sandwich, but the sauce had nuts so it just ended up being the mushrooms. It was pretty good (7/10), but the real winner of that sandwich was the bread! It was super fluffy with the perfect amount of chewiness—I’m not sure if they bake it in house or what but that bread is amazing. Their dishes seem very innovative, but nut-heavy. I imagine someone with fewer food sensitivities than myself would have enjoyed it more because I’ve heard nothing but rave reviews about Sun Café from my LA vegan friends. TL;DR: Delicious ramen, vegan egg is not worth the hype. One of the places I was most excited to try was Ramenhood. Kind of far from where we were staying, Eddie and I made the trip downtown with my childhood BFF to check out one of the most hyped vegan eateries. Tucked just inside the downtown LA Grand Central Marketplace, Ramenhood has limited seating (about 10 seats total) along the bar with some shared tables with the eateries around it (it’s kind of cafeteria-style). We each got a bowl of ramen (Eddie and I both ordered the Spicy Ramen and Ashley ordred the OG ramen) with a vegan egg for everyone to try. I was surprised at how creamy the broth is; it’s rich and full of umami flavour as I remember pork ramen being. The sunflower seed is the base to make that white, rich, creamy soup, while the noodles are wonderfully chewy and hold their own in the broth. The king oyster scallop coins were unbelievably delicious. They were salty, chewy, and lent a bit of a tougher texture that helped balance the softness of the noodles in the broth. The spiciness of the bowl was just perfect. Not too overpowering, but delivered just enough of that kick to keep you wanting more. The bok choy added just a touch of green and crunch to the soup, but I think they could have added a bit more veggie goodness because otherwise it was a pretty big bowl of carbs. I could rave about the ramen soup itself forever, but I’ll admit that I was a bit disappointed with the vegan egg. It cost $2—surely because it’s stunning and beautifully convincing visually—but it sort of fell apart and disappeared once I ate it. The flavour is from the spice on top, which if you saw in the video I promptly inhaled in the wrong manner and choked on it. The “egg” itself was made of agar agar, which if you’ve ever had before, has almost a chunky texture to it when you eat it. Not unpleasant in itself, but because how convincing the egg looked, I was hoping it’s be a firmer texture much like firm tofu or, y’know, egg. I think it was fun to try, but I’d definitely just go for the soup on its own and skip the egg. TL;DR: Healthy fast food. Delicious—but the fries are fried, so don’t get those if you’re not into soggy fries. I had the guac burger (8/10) the air fried fries and sweet potatoes (5/10). I was really impressed with how delicious the guac burger was. Lots of crunchy veggies, fried tortilla bits inside, creamy avocado, and the veggie burger itself was really good. I definitely would get that again. The “air fried” fries were sort of a disappointment. TL;DR: Probably would have enjoyed this much more if it weren’t nearly 40ºC, but it was really fun! Upton Natural’s Jackfruit barbacoa nachos (8/10)— I forgot to check if the cheese sauce was nut-free—I want to say that it was but I got hives the next day so maybe it wasn’t. BUT the jackfruit barbacoa was super delicious. I’d totally buy Upton Natural’s if it were available in Canada, but I saw some at the Trader Joe’s around the corner from where we were staying. Thai Slider from Tofurky (7/10)—I’ve always been a big fan of Tofurky but I’ve never been this creative with their products before. Adding fresh cherries along with pickled veggies and greens was surprisingly really good! I might try using cherries on a burger again in the future. Follow Your Heart Caesar Salad and Grilled cheese (8/10)—I was impressed at how good the grilled cheese was. I’ll have to try some FYH slices in grilled cheese instead of using Daiya because it definitely didn’t have anything like that signature Daiya aftertaste. TL;DR: Vegan gourmet—worth the hype. First off, I was surprised with how many premade products were used at Crossroads. In case you didn’t know, Crossroads is vegan Chef Tal Ronnen’s restaurant in LA to entice vegans, flexitarians, and omnivores alike. It’s upscale with super attentive service, elegant décor, and a concise but varied menu. Since it was an upscale restaurant, I wasn’t expecting products like Follow Your Heart’s vegan egg and Field Roast’s breakfast sausages on the menu when I joined Cobi and her best friend for brunch, but I guess that simply shows how good those two products are, because I ordered the vegan egg bagel with Field Roast Chao cheese and the FYH vegan egg (9/10). It was so unbelievably delicious: not only the vegan egg and the cheese, but also the bagel was unreal. It was an everything bagel with plenty of onion, garlic, poppy seeds and sesame seeds to delight my tastebuds, but the texture of the bagel was just… wow. The perfect balance between light and dense, yet chewy and nearly melt-in-your-mouth after a few quick bites. I brought some FYH vegan egg back with me so I hope I can replicate it with some bloomer’s bagels that are equally as delicious. Eddie ordered the chicken and waffles (vegan, of course) and was surprised that the two condiments provided were a spicy sauce (not even a spicy syrup) and a huge ball of butter. He said it was good but he would have liked some sort of syrup, as chicken and waffles tend to have that option (even the ones at the Hogtown Vegan have spicy syrup!). He ranked it at 8/10, but he said he’d give it a 9 if it had some of the syrup. The waffles had an almond ricotta layer in it, but Eddie has no idea what ricotta is and he didn’t notice it. I also ordered a kale Caesar salad that was simply delicious. I don’t know what it is about Caesar salad, but it was always my favourite, even before I was vegan. It was salty, creamy, refreshing with a tender crunch (I’m starting to see a pattern in the types of foods that I’m raving about). The vegan Caesar dressing had that slightly stinky saltiness that makes it stand out from the other ho-hum salads out there. The kale soft and silky but had just a bit of resistance to help balance that ultra creamy dressing. Cobi had the carrot lox bagel, which was the same everything bagel that I had, but a beautiful looking carrot lox with a cashew cream cheese. From her reaction it seemed like a solid 8 or 9 out of 10! But no cashews for me, so I couldn’t try any. Ross also got the kale Caesar salad and ordered a side of Field Roast breakfast sausages. I wish I saw those in Canada, but I don’t love breakfast sausages anyway, so it all works out. I ordered a strawberry hand pie for dessert and Eddie got a hot fudge sundae (7/10). He said it was relatively underwhelming—mostly just vegan vanilla ice cream. I think now that he’s been around me for so long, he has such high standards for vegan ice cream that anything decent is a standard for him. It looked good to me, but a 7/10 is a pretty positive score for Eddie. My hand pie on the other hand was really good. It was like a flaky pop tart with some of the sweetest strawberries I’ve ever tasted. It tasted even more strawberry-like than the strawberries I get at home, if that makes any sense. TL;DR: Delicious. Everything is delicious. I was surprised at how HUGE this place was. There is tons of seating inside, outside, and it’s a beautiful space. Very farmhouse industrial with green everywhere! We decided to split two dishes: the jackfruit carnitas tacos and the BBQ pineapple pizza. There are tons of places all over LA that use jackfruit, and I clearly couldn’t get enough of it. The jackfruit carnitas were sweet and juicy, melting in your mouth like how hearts of palm sort of melt in your mouth. All the salsa and toppings of the tacos were delicious on their own, making an amazing taco that had everything you could want. Refreshing crunch from lettuce, a generous amount of jackfruit carnitas, tender and flavourful black beans, spicy tomatillo salsa, and a really tasty cucumber salsa to go on top. Eddie enjoyed it even more than I did. I think he gave it a 9/10 while I gave it an 8/10. The pizza, on the other hand, was one of the best things I had eaten on this trip. The crust rode that fine line between thin and doughy and nailed it. It was just perfect. The BBQ sauce wasn’t too overpowering for the whole pizza (sometimes BBQ sauce can be too vinegary and just overwhelm whatever dish it’s flavouring), the pineapple was the sweetest and juiciest I’ve ever had on a pizza, and the FYH cheese was so delicious! I will have to seek out FYH shreds to use at home. The onion wasn’t too overpowering either, which I very much enjoyed. I added extra hot sauce on top of the pizza and it is 10/10 folks. We were so stuffed we couldn’t finish the pizza, but we brought it to the airport with us so we could eat that for breakfast. Cold BBQ pizza for breakfast. 10/10. We finished off the meal with some coconut soft serve (which I learned later was from Kind Kreme) that was so creamy, cool, and perfect for that ridiculously hot day, and I really wanted to see if I could make my own Rita’s Ice and Custard with this soft serve. This ice cream is so seriously good, 10/10. Hands down. I would have said best vegan soft serve I’ve ever had in my life BUT I recently just tried the Beechwood Doughnuts soft serve, which tasted like how the Bunner’s soft serve USED to taste (they seem to have changed the recipe this year), and the Beechwood soft serve is an 11/10. It’s every bit as creamy as the Kind Kreme soft serve, but the KK one has a fairly prominent coconut flavour, which I like, but I prefer the neutral soy flavour that the Beechwood one has. But still 10/10 in my books. TL;DR: Only the ices are vegan. But they’re all really good! I wanted to DIY my own ice and custard, so I dolloped some coconut soft serve on top of some Rita’s FRESH pineapple ice. It was a blazing hot day and the ice and ice cream was just the perfect way to end the day. You could tell that the pineapple ice was made with real pineapple: it had that same sort of frozen pineapple mouth feel and the flavour was outstanding. Paired with the Kind Kreme coconut soft serve, it was like a cool, creamy, icy, but super pineapple flavoured piña colada. 10/10, would eat again. I think the next time I’m in LA I’ll probably have to try that again but with a different flavour of ice! I didn’t get to try all the places I wanted to eat. To conserve money and our waistlines, Eddie and I tried to eat out only once a day, although there were a couple times where we had more than one meal out (mostly the first day and the last day) because we couldn’t just go back to where we were staying and cook a meal. On the days in between, it was so hot that sometimes we’d just eat half a mini-watermelon and call it a day. I hope you enjoyed this and this review was helpful to you if you ever find yourself in the LA area! Check out my video of all the places to see all the food up close! This is awesome! I know it can be really hard finding vegan-friendly spots, especially when you're in a new place. Glad to see you didn't have much of a problem with it there! 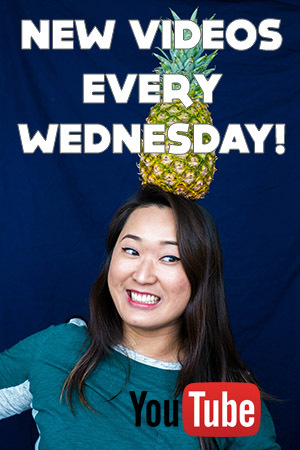 I live in L.A. and loved reading your review about restaurants I frequent! Vinh Loi Tofu, Shojin (DTLA) and Rahel Ethiopian are my absolute favorites. Another to add to your list is Satdha Thai in Santa Monica. For some reason I rarely hear it mentioned in the vegan world, but it is TO DIE FOR and deserving of all of it's 4.5 Yelp stars. Happy Eating!